Today, with lots of visitors from out-of-town, including a set of nieces and grandnieces and nephews from North Carolina (Krishnammal’s doctor sister’s daughter having married Krishnammal’s elder brother’s son – a very traditional Indian arrangement), we are having a festive outing. We are going to visit Krishnammal’s ancestral village of Ayyankottai. Ayyankottai is located some 30 kilometers from Gandhigram, virtually in the shadow of the Kodai Hills. Krishnammal says you can actually see the lights from the town of Kodaikanal at night. Our jeep and the incongruously purple Chevy minivan make their way over what once might have, on its better days, and never during flood season, be described as a road, past stretches of paddy fields and coconuts groves. Just as I have adapted to the level of the jeep’s pitches and rolls, and am nodding off, we are there! Word has gotten out that Ayankottai’s most famous citizen has arrived, and the whole town, or so it seems, has come out to greet us. Ayyankottai has 600 families. During Krishnammal’s childhood, there were perhaps 300, with all but 32 being Dalit. So it is the caste Hindus, being a distinct minority, who occupy the far side of the village, perhaps a little bit wealthier, but here the Dalits are dominant, and have married each other internally within the village for centuries, and set the tone. This, among many other factors, begins to explain the extraordinary self-confidence with which Krishnammal carries herself. There is a well-built Dalit temple in the middle of the village, built in 1996, with Krishnammal’s name on the dedication plaque (in Tamil, of course.) The temple is dedicated to the “Goddess”, some version of Parvati, representing the feminine powers of the universe. The caste Hindus, having appropriated the male powers to themselves, the Dalits in this town (and contrary to many other Dalit villages who worship Madurai Veeran or Karpenasami, male warrior-like figures) have found refuge in the female. 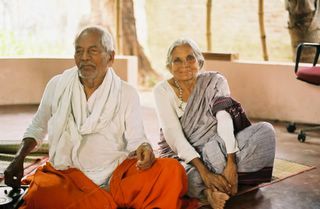 We make our way through very narrow straights, followed by several dozen children, their elders standing in doorways and greeting us as we go by, and now we are in the home where Krishnammal was born! The house, where Krishnammal lived with 11 brothers and sisters, mother, father who used to beat her, and occasional other relatives, has three rooms – a living room, perhaps 12 feet by 16 feet, a bedroom, maybe 12’ x 14’ in which all the children slept, and a traditional kitchen, with rolling stone and hearth. There is also a “wash room”. The house is now occupied by Krishnammal’s eldest brother’s wife, and various relatives. One major change in the house is that all the walls are now of stone and blue-washed brick. When Krishnammal grew up, they were all of mud. She tells me that, partially in tribute to her (or so I think I can infer), the village elders have decreed that there are to be no mudhuts, and in the past five years, in the event that a villager can’t afford brick walls, the village association will pay for them. We walk further into the village, and meet Krishnammal’s younger sister, a little further and here is the house where the great Ayyah (grandmother) of the Krishnammal family was born. We are going out to the field to visit Ayyah’s grave, past palm trees, to the rice paddies owned by the Dalits. Here are the very four acres that Krishnammal’s grandfather won in a bullfighting competition, divided into three for each of the three brothers. Krishnammal says her family used to eat off the rice (two crops) and vegetables (mostly tomatoes and okra – “ladysfingers” – one crop) they raised each year. Then, they worked on the land of others, and saved every rupee for the children’s education. Here is another anomaly: a majority village of Dalits that has owned their own land for many generations. And here is the place where Krishnammal and her sisters used to sleep out in the fields in a little hut, and the well that her father and elder brother dug in 1935-1936. Each morning, before going off to school, Krishnammal and her siblings had to clear the well of sand. The well is made of blocks of stone hewn from the mountains some seven kilometers away and brought by hand and bullock cart to the edge of the field. Ayyah is buried just the other side of the well, under a coconut tree she planted herself. I am surprised to see that she was buried but not cremated, but Krishnammal says that burial is the custom among Dalits. In addition, the followers of Ramalinga, the saint of the inner light, believe in burial, as Ramalinga believed that the light, the life energy, left the body slowly, and the body having served as a temple for the light during one’s life, was not to be burned. Prayers are said and prostrations made at the gravesite. A man climbs Ayyah’s tree, now 40-50 feet high, and drops coconuts from the top. We all have a drink from them. Bhoomi notes that the meat of the coconut is often sold in two forms – “like dosa” (meaning the meat is hardened and ripe) or “like (please pardon) snot”, meaning it is still wet and running. I am surprised that this description is seen as a selling point. It is back to the village. This time we are greeted mostly by men, who gather around the van and jeep as we pile in. Krishnammal tells us about attending the village school in the next village. Surprising, at least to me, the school – a private school run by the merchant caste – was open to whomever could pay for it, although Dalits had to sit in separate parts of the classroom. Krishnammal was always first in her class. Her father used to come in from the fields, still covered in mud, to watch her receive her awards. Krishnammal says there was a belief in those days that one should eat a ladysfinger raw every morning to improve one’s mathematical abilities. Sathya tells us a story I have never heard before. It seems that at one point, when Krishnammal was nine or ten, there was a plan for the entire family to migrate to Malaysia, where there were more opportunities for laborers. There was a great drought, and the family was reduced to eating only onions and ladysfingers. The bags were already packed, and kitchen goods already dispersed to the relatives. Krishnammal’s aunt warned them, however, that, Krishnammal being more fair-skinned than the rest, might be married off to a Malaysian, and the lineage would be lost. There might have been a different set of stories to tell.